Pala Casino is part of the hotel casino and spa resort located close to San Diego, operated by the Pala Band of Mission Indians. The Pala Indians are a federally recognized tribe and the casino is located on their reservation. Pala Casino was opened back in 2001. It is a very large resort with 500 rooms, more than 80 of which are suites. As the full name of this facility suggest, there’s both a spa and a resort in addition to the casino. But, Pala also offers a range of other amenities. If you visit it, you’ll be able to enjoy in the Center Bar, watch a show in the Palomar Starlight Theater, or grab a bite at one of the restaurants, including Promenade Deli, Pala Café, The Oak Room, Cave and several other. Even though the gaming area at Pala is 10,000 square feet large, i.e. there are quite a few larger casinos in the country, the gaming offer at this casino is still quite impressive. You will find 2,000 slot machines and more than 2,000 tables. Pala features many Blackjack tables, where you can play several variants of the game, including variants based on interesting side bets like Buster Blackjack and Pala Pairs. 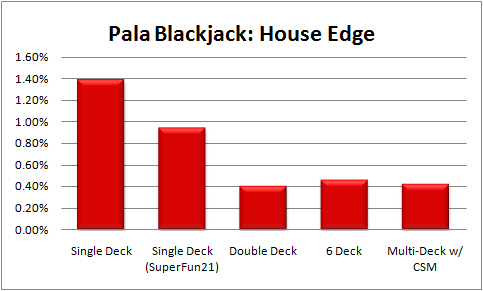 Pala’s 6-Deck Blackjack can be played with as little as $5, during certain days at periods when there’s a low player frequency. At other times the minimum table limit may be $10, $15 or $25. The maximum limit, if you play at some of the tables in the high-limit room is $5,000. The rules are the following – dealer hits soft 17, you can surrender, re-split aces and double after splitting. The house edge for this game is 0.43%. The multi-deck version which features a continuous shuffle is very similar to the 6-deck game. Here the limit can be either $5, $10 or $15, whereas the maximum bet is also $5,000. You may double after splitting, re-split aces and surrender, whereas the dealer is supposed to hit soft 17. The house edge for this game is only slightly above 0.40%. The double-deck variant has a minimum table limit of $25, whereas the maximum amount that you can bet is again $5,000. The rules are also somewhat different, the also hits soft 17 and doubling down after splitting is permitted, but you can’t re-split aces or surrender. However, due to the fact that only 2 decks are used, the house edge is quite small – 0.40%. The single-deck game has a much lower maximum tablet limit at $1,000, whereas the minimum bet is $25. The dealer hits soft 17, doubling down after a split is allowed, so is re-splitting aces and surrendering, but Blackjack only pays 6 to 5, instead 3 to 2. This makes the game a lot less favorable, as the house edge is 1.40%. Super Fun 21 is a special version of single-deck Blackjack available at Pala. The table limits are the same as the ones for regular single-deck Blackjack. Here the dealer has to hit soft 17, whereas the player may double down even after a hit, may double after a split, is allowed to double or hit split aces and can surrender after hitting. On the other hand the Blackjack pays only even money. This game offers better house edge than the standard single-deck Blackjack – 0.94%. Free Bet Blackjack is a relatively new variant of the game which is available at Pala Casino. In this game, the player is allowed to double and split without placing an extra wager, i.e. for free. And if you double down for free and win the hand, you will be paid double the amount, even though you didn’t place an extra wager. In order to compensate for this generous rule, the dealer doesn’t lose when the score of their hand is hard 22. Those bets are a push instead of a bust. There is an interesting side bet in this game. You can bet that the dealer with push with a 22 hand. This bet wins in every occasion when the dealer’s hand is a hard 22. If all of the dealer’s cards are of the same suit, the side bet pays 50 to 1. If they are all the same color it pays 20 to 1, whereas any other combination pays 8 to 1. Pala Pairs Blackjack is a special variant and it is extremely difficult to find it anywhere else other than Pala Casino. The rules are just the same as with normal Blackjack, except that both player’s cards are dealt face up. The Pala Pairs side bet is a win whenever the player’s cards are a pair. A suited pair pays 20 to 1, whereas a regular pair pays 9 to 1. This bet is won or lost right after the initial two cards are dealt. After that, the game goes on as usual. This game was introduced in 2011. Buster Blackjack is a very interesting side bet, which allows you to bet that the dealer is going to go bust. If that occurs, not only will you win your regular bet, but also the side bet. The pay-out depends on the number of cards that the dealer has at the time when they go bust. If the dealer’s hand is consisted of 3 or 4 cards, the pay-out is 2 to 1, but if the dealer is holding a 5-card hand that went over 21, then you’ll get a 4 to 1 pay-out. The pay-out for 6 cards is 15 to 1, whereas if the dealer hits a seventh card and then goes bust, you’ll get a 50 to 1 pay-out. Should the dealer busts after the 8th card or later, you will get an amazing 250 to 1 pay-out. Blackjack Switch is a popular variant which can be found at many casinos. Here, the player is dealt two sets of pairs at the beginning and is allowed to switch the second card of the first pair for the second card of the second pair, in attempt to improve their hands. As a result, since this rule makes the game more favorable for the player, the dealer pushes with a hard 22 and Blackjack pays even money. The dealer hits on soft 17. Card counting at this casino isn’t that difficult, as there are quite a few tables and game variations. Bear in mind that most 6-deck games have a $500 maximum bet limit, if you hop in on the table in the middle of the shoe. You are advised not to try card counting at the single-deck tables, or at the high limit tables, as it is more likely that you’ll draw the attention of the casino staff. Pala Casino is one of the best casinos in California in terms of game variety and house edge. Every Blackjack fan will be able to find their favorite version, as this casino offers a vast range of variants, with multiple intriguing side bets. The table limits are flexible and it is possible to count cards. Most Blackjack players will be satisfied with this casino. Pala Casino does a pretty nice job of sending out a steady stream of promotions including cash vouchers, hotel rooms and occasional invites to tournaments. The tournaments are good since they play with just one deck, but use double deck rules. This gives card counters plenty of opportunity to use their skills in a short period of time. The majority of Pala’s blackjack tables are 6 decks that have a $500 max bet if you jump in on the middle of a shoe. It’s helpful to know this restriction if you’re card counting on a team and signaling in a big bettor “MIT style”. I recommend that if you’re counting cards you stay on the main floor and don’t play in the high limit room where you’ll draw more attention. I can’t say I religiously follow this tip myself though.